Kolams are thought to bestow prosperity to homes. Every morning in Tamil Nadu, millions of women draw kolams on the ground with white rice powder. Through the day, the drawings get walked on, rained out, or blown around in the wind; new ones are made the next day. Every morning before sunrise, the floor of the owners house, or where ever it may be, is cleaned with water and the muddy floor is swept well for an even surface. The kolams are generally drawn while the surface is still damp so that it is held better. Occasionally, cow dung is also used to wax the floors. In my culture, cow dung is believed to have antiseptic properties and hence provides a literal threshold of protection for the home. It also provides contrast with the white powder. Decoration was not the sole purpose of a Kolam. In olden days, kolams used to be drawn in coarse rice flour, so that the ants don’t have to work that much for too long for a meal. The rice powder is said to invite birds and other small critters to eat it, thus inviting other beings into one’s home and everyday life: a daily tribute to harmonious co-existence. It is a sign of invitation to welcome all into the home, not the least of whom is Goddess Lakshmi, the Goddess of prosperity. The patterns range between geometric and mathematical line drawings around a matrix of dots to free form art work and closed shapes. Forklore has evolved to mandate that the lines must be completed so as to symbolically prevent evil spirits from entering the inside of the shapes, and thus are they prevented from entering the inside of the home. It used to be a matter of pride to be able to draw large complicated patterns without lifting the hand off the floor standing up in between. Powdered white stone (வெங்கசங்கள் பொடி / மொக்குமாவு) was used for Kolam. The month of Margazhi was eagerly awaited by young women, who would then showcase their skills by covering the entire width of the road with one big kolam. In the kolam patterns, many designs derived from magical motifs, abstract designs and philosophic and religious motifs have mingled together. Motifs may include fish, birds etc. which reflects the unity of man and beast. Sun, moon and other zodiac signs are also used. The ritual kolam patterns created for occasions such as weddings can stretch all the way down streets. Patterns are often passed on generation to generation, from mother to daughter. Seasonal messages like welcome (நல்வரவு) is used in Kolam. Volunteering to draw kolam at temple is sometimes done when a devotee’s wishes are fulfilled. For special occasions limestone and red brick powder to contrast are also used. Though kolams are usually done with dry rice flour, for longevity, dilute rice paste or even paints are also used. Modern interpretations have accommodated chalk, and more recently vinyl stickers. Though not as flamboyant as its other Indian contemporary, Rangoli, which is extremely colourful, a South Indian Kolam is all about symmetry, precision, and complexity. Due to these design’s complexity, trying to figure out how, exactly, these designs were drawn can be a challenge that some viewers find enjoyable. a pattern, in which a stroke (Kambi, Sikku in Tamil) runs once around each dot (Pulli), and goes to the beginning point (endless/cycle), as a mostly geometrical figure. The stroke called as Neli from a snaky line. The stroke has Knot (Sikku) structure. a pattern, could fill or use part of the dot grid. If that is the case, the same pattern, or a different pattern fills/uses up the remaining dot grids. Most of the times, these patterns together end up becoming a complex pattern. a pattern, in which a stroke runs around each dot not completely, but open. a pattern, in which strokes (Kodu/Kotto)are connected between the dots. Sometimes it represents kinds of objects, flowers, or animals etc. a pattern, in which dots are set in a radial arrangement, called Lotus. a pattern, which is drawn in a free style and mostly colorised. 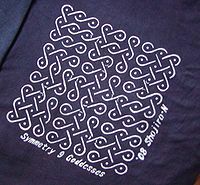 The mathematical properties of Kolam is being used in Computer science field. Kolam patterns are studied and algorithms are developed for regenerating kolam designs with different patterns has been done.Algorithms for drawing kolams are used in development of Picture drawing Computer software. Kolams are used for research in the Computational Anthropology. As Kolams have a strong relationship with contemporary art and art history, they are used in the artwork and media field.